Rig It Right! 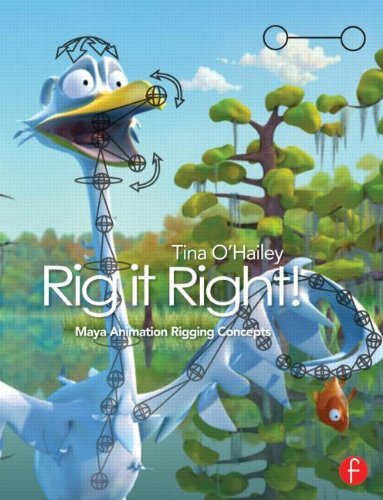 is a wonderful hands-on tutorial book on rigging using the Maya software. It's written by Tina O'Hailey who has taught at Disney, Dreamworks and Electronic Arts. There are three parts to the book with 19 chapters. The first part has all the basic concepts, which are all the tricks and techniques of the software and how you can use them to rig. Second part covers the rigging of a biped, from head to feet, and wings (see the bird on the cover?). Last part are on advanced techniques, basically additional techniques to achieve particular rigs, movement and controls that aren't achievable with basic rigging. It's hands-on tutorial style from the start so it's quite easy to absorb what's being taught. There are accompanying screenshots but they can be a bit too small at times though, making it difficult to see the pop-up menus, but they are in the easy-to-follow instructions anyway. The text is written in a conversational tone which is quite a pleasure to read. The link to the tutorial files are located at the back cover. There are 17 rigs used throughout as examples. It's a great book to get to practice and improve on your rigging. Focal Press has provided this book for the review.